Top 10 Travel Tips that will Save Time, Save Your Back and Ease Your Worry! Travel can be an exhilarating rush or a daily grind. Either way, we have 10 can’t-miss savvy travel Tips to lighten your load and make travel a breeze! 1. Carry-on vs Check – If there is any possible way you can carry-on instead of check, do it! 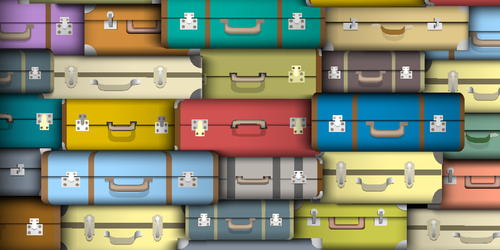 No more waiting at the claim or risk of delayed luggage at the start of your vacation. We are currently on a 16-day vacation to France and Spain and I fit everything in a carry-on (granted it is summer). I included an extra bag that folds up in my luggage for gifts, clothes and shoes I buy on my trip and will check my bags on the way back. My friends know I’m a bit of a fashionista. If I can start my vacation in a carry-on, so can you! 2. The Right Luggage – After traveling for work almost every week for 15 years, I was on a quest to find the perfect durable carry-on with the most capacity. The Kipling Discover and Darcy are my favorites. I’ve had my latest Kipling rolling duffel for about five years and for many of those years traveled every week and because of the quality it is still in great shape (and I often overfill it and strain the zippers). For those who need ample space for toiletries, acquiring a hanging toiletry bag is excellent because you can hang it at your hotel. Be sure to use a clear bag for your liquids and place it on the belt at security. Take special care to make sure all your bottles are closed tight! Remember to pack your liquids in 3.4oz leak-free containers and, unless you are traveling to a very remote locale, don’t fret, you can almost always buy what you need when you arrive and save some precious space in your bag! 3. Make a Packing List and Then Stack it Up – For longer trips I do this about a week prior to leaving and often cross a lot off the list as the days slide by. About three days before your trip set everything on your list out in plain site, in a organized way. Your subconscious will take over and quickly differentiate between what you think you need and what you really need. How many days will you be gone? What items can serve multiple purposes? Now put one or two outfits back in your closet. Let’s be honest, have you ever worn every outfit you’ve brought on a trip? And if you need one more you can always shop! For the women, scarves and wraps that can sub for jackets and sweaters look fantastic and save quite a bit of room! 4. Flat or Roll? Roll! – It’s funny, my husband rolls all of his clothes and I’ve always preferred the flat and stack method. But, I finally tried his method and, low and behold, I got more in and less wrinkles to boot – thus I am now a roll fan! I always fill my shoes with small items, place them in bags and lay them in the bottom of the carry-on in order to use the space as strategically as possible. 5. Leave Your Bling at Home – I’ve learned this one the hard way. I’ve left expensive items in fancy hotels that were never found again after check-out. So if you’d be crushed to lose it, then leave it at home! 6. Charge Your Devices – Make sure you have a full charge before heading to the airport and keep your chargers handy because some of the lucky will have outlets on the plane. A handy portable charger is great to have too! They are small and provide a charge in a pinch. Have you ever had to search high and low for an open outlet at an airport? Yeah, no fun! So don’t leave home without a full charge! 7. Tag Your Bags – It’s just smart to add your name, phone number and email address to a bag tag. If you’ve ever lost your bag in an airport, a train or bus station, or a hotel misplaced your bag, you know how valuable the tag can be! 8. Check-in Online ASAP (usually 24 hours before a flight) – This will save you time at the airport and may secure you a better seat! 10. Keep These Items Handy While On-Board a Long Flight – Don’t forget your toothbrush/paste, eye drops, healthy snacks, a pen, travel guides and other reading materials (preferably in electronic form to save room), noise cancelling headphones, downloaded shows and movies, podcasts and water. Drink lots of water! 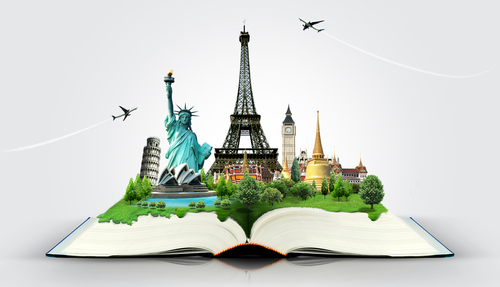 Traveling internationally? See trvlvip’s Five Traps Smart Travelers Avoid! Follow these top 10 travel tips to save time, worry and your back!